cheap and simple audio delay schematic? > cheap and simple audio delay schematic? just wondering if anyone could help me out with the non-arduino side of a musical instrument design problem. i'm designing an electro-acoustic vibraphone. instead of using air columns (resonator pipes) to amplify the metal bars, i want to use audio speakers. in order to resonate (and thus amplify the fundamental note of the vibrating metal bar) the sound waves traveling from the speaker need to arrive at the metal bar at precisely the right moment to complement its movement. if the sound waves from the speaker are out of sync with the vibrating bar, they might "cancel-out" the movement of the bar, therefore making the note sound "dead". i can solve this problem in one of two ways. one way is to change the distance between the speaker and the bar, so that the sound waves arrive at the bar at precisely the right moment. i can't do this since i'm using one speaker between several notes, and i want to make the instrument compact. this way, i can "tune" the electronic resonator by adjusting the delay time so that the sound pressure levels from the speaker coincide with the bars' vibrations. 2. i need many such delay modules, one for each note of the vibraphone, so they need to be cheap and easy to make. is anyone able to suggest a suitable schematic, or point me in the right direction?? 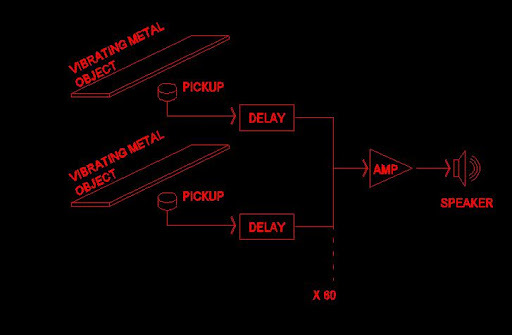 Re: cheap and simple audio delay schematic? oh, i forgot to mention that yes - i have considered just putting some pickups under the metal bars, then running the signal through an amp placed somewhere next to the instrument. the idea here is to make an instrument that feels just like a traditional, pipe-resonated vibraphone when you play it. to achieve this, there needs to be a direct interaction between the reproduced sound and the physical vibration of the metal bars. kind of like a feedback effect. Now this is an interesting project. However, you also need to take into consideration the mechanical limits of your vibrating bars. When a bar "sings", if you then further excite it by feeding back a positive resonance signal, the bars amplitude of vibration will increase (the design intent) which in turn will give a greater output, which will increase feedback, which will increase output ------- ad infinitum. 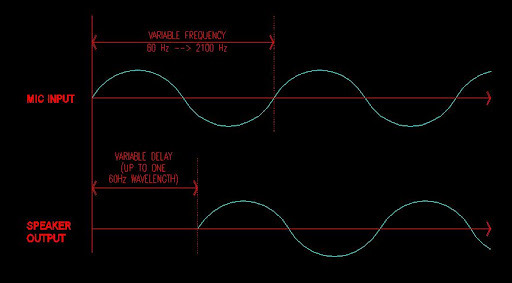 So you need to, not only provide suitable phase shift to give positive feedback but also to limit the amplitude of excitation to prevent either end-stop bashing or self destruction, and develop a means of effectively controlling volume output.